Eggs painting demonstration, part II. An easy method! In this eggs painting demonstration, we have our final 2 layers shown below. Allow me to talk a little more about each piece. And when done, maybe you'll have the tools needed to try a few of these yourself! Keep the composition simple, and you'll succeed! The joy will be in seeing just how realistic your eggs will become, especially if they are close to life sized! In our first part of the lesson, we took care of the transition from the well lit side of the egg, to the shadow part of the egg. If you missed that part of the demonstration, you can head back here. 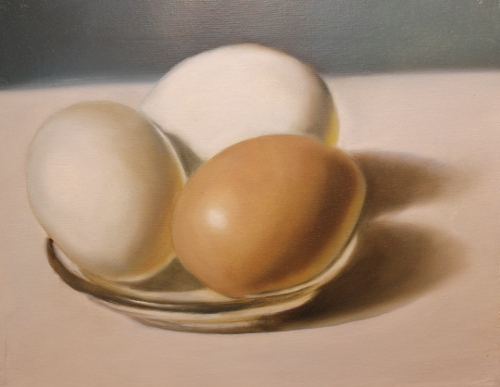 That beginning gray layer really cements the realism you are attempting to achieve in the smooth transition of light to dark on the egg surface. Here's the first color layer. The heavy ink lines on the cast shadows are gone, and I've added a burnt umber to the front egg on the right. My little shadow around the edges is also disappeared! Each egg gets its cadmium yellow medium glazing for its secondary lighting. The glass plate gets a few highlights, and the back edge of the table is blended well to take it out of sharp focus and push it further into the background. A few things to look for on this painting. The top of each egg is also blended more than the bottom (or front edge). This helps in taking that part of the eggs out of focus. Closer items are kept sharp. I have a complete explanation of this technique and the importance of hard and soft edges here. My wife says she likes this painting the best. It has a painterly feel and look to it. Should you decide to try these eggs, you can stop at this point too if you wish. As a realist, I wanted to take this painting to the next level. This last eggs painting is showing where I've added my last highlights, and reinforced certain areas on the painting. Each egg gets its super white highlight. Shadows on each egg are darkened one more time. The glass bowl has its edges redefined, darkened in areas, and the 2 highlights reinforced. The highlight on the bowls right edge has a bit of umber added to it to mimic the reflected color of it's egg. Oh, and the signature. and also a name. A recent thread in my favorite art forum gleaned a helpful hand in that regards. Thus, Eggs Posed was chosen! A 9" X 12" oils on canvas series of eggs in a dish. Now, on a side note. One of the joys of raising chickens is that the eggs in a still life like this can be most colorful. We have one breed now that lays a green colored egg. She is also a beautiful bird with a golden head and body feathers that range from browns to red. 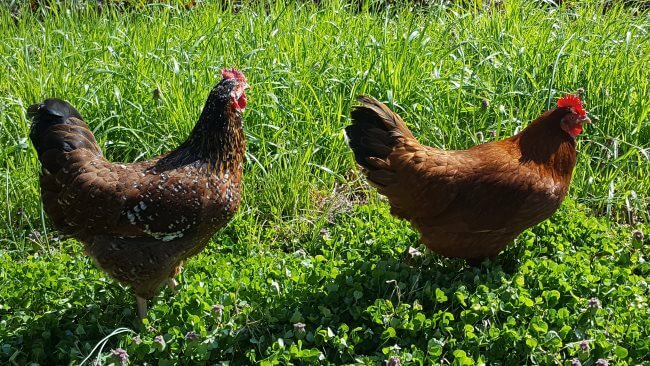 Below is a picture of a couple of our girls, checking out the clover and rye grass before I turn it under for fertilizer in the garden. Are you interested in raising your own chickens, and having a full supply of fresh eggs for breakfast, and for eggs painting subjects. Yes, I paint my birds and their eggs a lot! Check out the best advice on chickens anywhere. Click here.